DAX is an awesome language and when paired with properly created relationships, DAX can add significant analytical value to your data models with minimum effort. But, you already knew that! So why are we here? Well, sometimes, DAX can produce results that are unexpected and this is usually very noticeable when looking at the totals row. So why do we get unexpected results at the total row? Why doesn’t the total row simply return the sum of all the rows in a specified column? The simple answer is your DAX calculation is also computed for the total row and operates within the contexts of the total row. Let’s take a look at the previous screenshot. 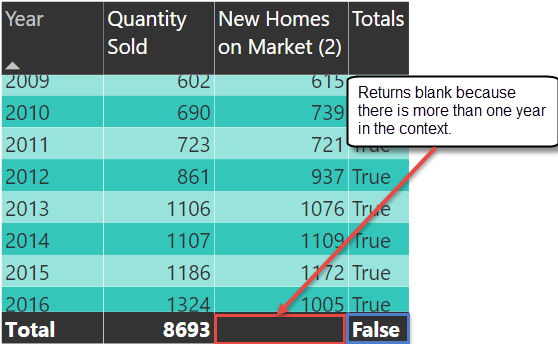 In this example, the total row is returning all homes listed for all years in the filter context, this is in fact the sum of all the rows in the column. However, you may expect to only see the homes newly listed on the market for the latest time period, in this case that would be how many homes were listed in 2016. The result of 8,691 homes listed in the total row is not wrong or incorrect, it depends on what you are specifically looking for, it could definitely be unexpected depending on your analytical needs. 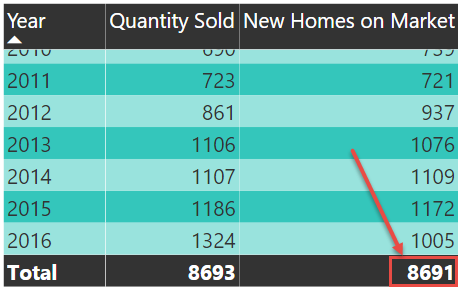 If you do not wish to see the total of all homes ever listed in the current filter context then you have a couple of options available to you. There are generally 3 ways you could address incorrect / unexpected totals. Identify when the DAX calculation is being evaluated for the total row and return a BLANK value. Identify when the DAX calculation is being evaluated for the total row and perform a different calculation. In this blog post you are going to learn how to return blank to eliminate any confusion. 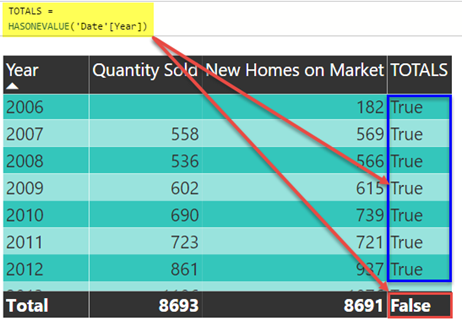 In a future blog post you will learn how to use DAX to change the value of the total row. In this simple example, the total row is the sum of all the rows, but this is not what we want. What we would want to show at the total row is how many homes have recently been listed for sale, not the total of all homes that have ever been listed. The first thing we must do is identify if we are at a total row. The way I do this is by using the function HASONEVALUE. HASONEVALUE: Returns TRUE when the context for the columnName has been filtered down to one distinct value only. Otherwise FALSE. In the screenshot below I created a new measure called “Totals” and in this measure the function HASONEVALUE is used to correctly identify which row is the total row. This works because at the total level the filter context is all years, so the function returns FALSE. The final step is to now use conditional logic and replace the Total row with a blank value. Now the total row is no longer confusing or misleading. In part two of this series I am going to take this a step further and show how to use DAX to return your expected results at the total row instead of just returning blank!